This--a chipotle pork cheeseburger--is what I'm going to eat tonight. We have leftover chipotles in adobo, and I bought some ground pork at the farmers market, and I made some mayonnaise, &c. I'm excited about this . Updated 10pm: and it was good. Less so by the glass of water, though. Actor is one of my favorite albums this year, and this is a killer performance. Thursday night in New York was hot--after weeks of rain, it was one of the first real summer nights of the year. Car windows were open all over the city, and just about every station on the radio dial had switched to an all-Michael Jackson format; for the first (and, for all we know, the last) time, it felt as if absolutely everyone was listening to the same songs. Now, the TSA doesn't even trust pilots, who go through the same screening as the rest of us to make sure they’re not bringing something extraordinarily dangerous onto a plane like a 3.5 oz bottle of shampoo. Because, of course, with a little bottle of shampoo, they could make a bomb, which they could use to fly the plane they are piloting into a building, something that is impossible for mere pilots sitting at the controls of the jet. I love farro, and I love beets. And they make a great combination! Here's what I did the other night to make a farro salad with roasted beets, arugula, walnuts, and goat cheese. 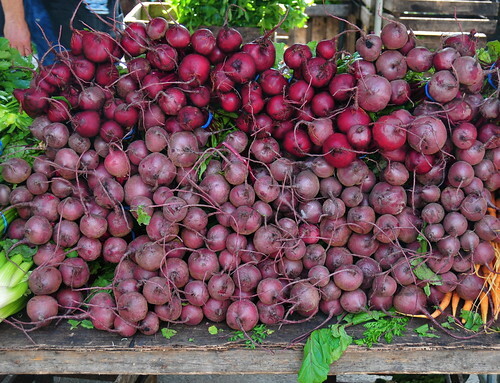 Prepare beets: toss with olive oil and salt, splash of water, cover with foil, roast for 30-40 minutes until done. Then remove skins and slice into wedges. Prepare farro: boil in salted water until tender (but still with a bite). Make a vinaigrette: combine diced shallot with red wine vinegar, lemon juice, balsamic vinegar, and a little bit of salt. Let sit for 5 minutes. Add olive oil. Toss cooked farro with arugula and some of the vinaigrette. Toss beets with some sliced shallots and some of the vinaigrette. Combine farro, arugula, and beets, and transfer to a platter. Top with toasted walnuts and crumbled goat cheese. Yes, so: I had high expectations, and Dirty Projectors' Bitte Orca really, seriously, is that good; by far, my favorite album this year, so far. My favorite track keeps changing--pretty much every track has a lot to recommend it--but I'm currently stuck on "Useful Chamber", which goes from mournful synths to spoken-word breakdown to guitar chaos, and all the way round again. I've had this in my head over the past couple of days. So, so great. Homemade, from scratch, is in the air. And in the June 2009 Gourmet, a burger with homemade everything: homemade buns, ketchup, mustard, and pickle relish, with a burger made from ground skirt steak.